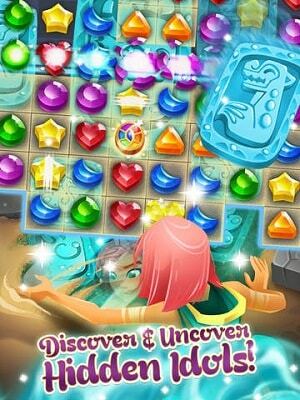 Genies and Gems is a magical themed puzzle matching title for iOS and Android devices. Employing a well known formula Genies and Gems is a game that is easy to get into and features a few unique matching puzzles for a nice change of pace. This mobile title follows the efforts of Trix, a fox and the female magic user known as Jenni. Together they match their way through 100s of levels which feature some light story elements to keep you engaged in the experience. Genies and Gems gameplay is similar to the many other games out there in the genre with a focus on the matching of various coloured tiles on a constantly changing game board. Players are rewarded handsomely for matching groups of tiles in lines of 4 or more to quickly clear the level and rack up a large number of points. 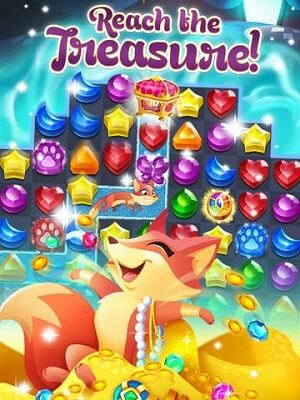 The majority of levels that Genies and Gems offers are set around Trix the fox moving from her starting location towards a treasure chest of goodies. In order to do this players will need to match the scattered paw shaped gems which must be matched with gems of the same colour. Each match will advance Trix one square closer to your goal for that level. This isn’t the only level type you’ll encounter in Genies and Gems either with other levels requiring players to collect all the gold by making matches close to these tiles or clearing obstacles from Trix’s path with a similar mechanic. Like most titles in this space Genies and Gems does a good job of mixing these up constantly so levels don’t feel overly repetitive. With all the other usual social features, limited number of moves per level and helpful one of boosts Genies and Gems is a very solid choice for puzzle match fans. Help Trix move across the game board to reach the treasure. Conquer levels with a limited number of moves. This game keeps crashing. I reached out to the support team and they told me to close out all apps, restart in 10 seconds. I did this and still it crashes and I automatically lose a life. Not impressed. I love playing your game however it crashes all the time!